Love wine? Then get ready for the Good, Better, Best Wines book! While wine snobs are swirling and sniffing expensive wines that are tediously hard to find, the rest of us are just drinking wine. Popular wine. Big-brand wine. Big brands can spell terrific value, but you need to know which bottles to buy. That’s where Good Better Best Wines, 2e comes in. It’s small enough to pop in your pocket and take with you to the store. And it’s user-friendly enough to flip through on the fly. This book ranks the best-selling wines in North America by grape variety and price point up to $15 (USD). And every bottle listed comes with a color photograph for quick and easy identification, so you can buy and run before getting stuck in a conversation with someone eager to share their vast wine knowledge with you! Of course, you’ll also get other important details, such as what ingredients created each wine, flavor and smell profiles, and alcohol content by volume–but in Carolyn’s relaxed, friendly tone. It wasn’t until I reached my late twenties that I began to appreciate a good glass of wine. I think my problem in the beginning was that I had no idea about the differences between the different types of wine and would just randomly choose a bottle based on price. This usually meant I grabbed a wine that tasted sour and was not easy to finish. Over the last years, I have learned to appreciate and develop a preference for specific brands and types of wine. I am in no way an expert but I do know what I like and what I don’t like (I like a sweet, smooth taste with not too strong of an alcohol taste). 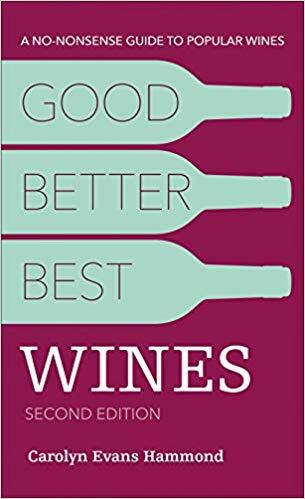 This well written and witty guide is the perfect guide book for those who love their wine but by no means want to be an expert – they want to find a great bottle of wine at the right price point. Carolyn breaks down everything you ever wanted to know about wine – from just the basics about prices, the battle of the cap to how to get the most out of a bottle (which fortunately we have never had to worry about as we always finish a bottle once it is opened!). She then dives right into the world of white, reds, rose and sparkling as well as bargain, dessert and party wines. The book is roughly 238 pages long and each two page section carries information on three types of wines. My mind was officially blown at the sheer volume of wine brands she shared! Some of them were familiar but some were new to me. She gives a great background on what each wine tastes and I love how visual her description is (you can almost taste it) as well as sharing pretty neat did you know facts and food pairing tips (although I could have used without the amount of calories in wine – just joking!). Carolyn has done an incredible job with this guide – she gives you advice that you didn’t even know you needed to know, like how full to make the glass to ensure you can fully appreciate the taste and aroma of the wine and the perfect temperature to serve each wine at. She gives you such a great variety and different price points, I found a few wines in there that I have been hesitant to try but actually did after reading her work, I was not disappointed at all! You can learn more about this book on DK Canada’s website and purchase a copy of this book here. Carolyn Evans Hammond is a two-time bestselling wine book author, the wine columnist for the Toronto Star (syndicated), and a seasoned wine judge. Over the past 15 years, she has appeared on CNN International, BON TV (China), GoingGlobalTV.com, Canada AM, and CITY-TV; she has been a guest on radio stations all over the United States; and she has written for top publications, including Decanter, Wine Spectator, Wine & Spirit International, The Times(London), Maclean’s, Quench, Taste magazine, and others. Constantly learning, Carolyn spends much of her time tasting wine, judging wine, and meeting with winemakers to keep abreast of the industry. She’s a longstanding member of the Circle of Wine Writers, holds a diploma from the Wine & Spirit Education Trust in the UK, and earned a BA from York University, where she studied English and philosophy. She has lived in many cities in North America and Europe and now resides in Toronto, where she was born. Her message is simple: Living well doesn’t have to be pricey or pretentious. It just takes a little know-how—and maybe a corkscrew. This entry was posted in book review, DK Canada.